Cavea, the No. 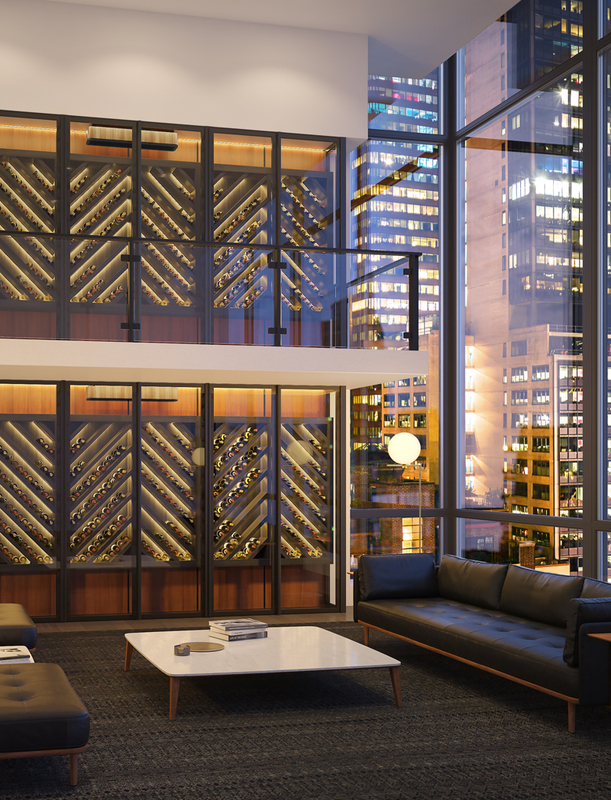 1 Custom Glass Wine Cellar without compromise on design. Recreates the same conditions found in natural cellars all within a glass enclosure. An effective barrier against radiation and UV rays. 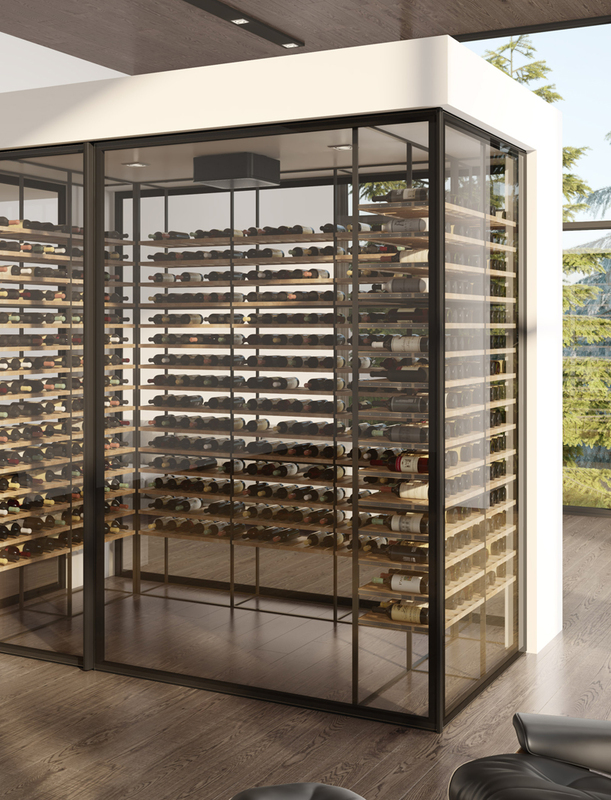 A completely airtight cellar with 21 different profiles. The system’s configurations are endless. 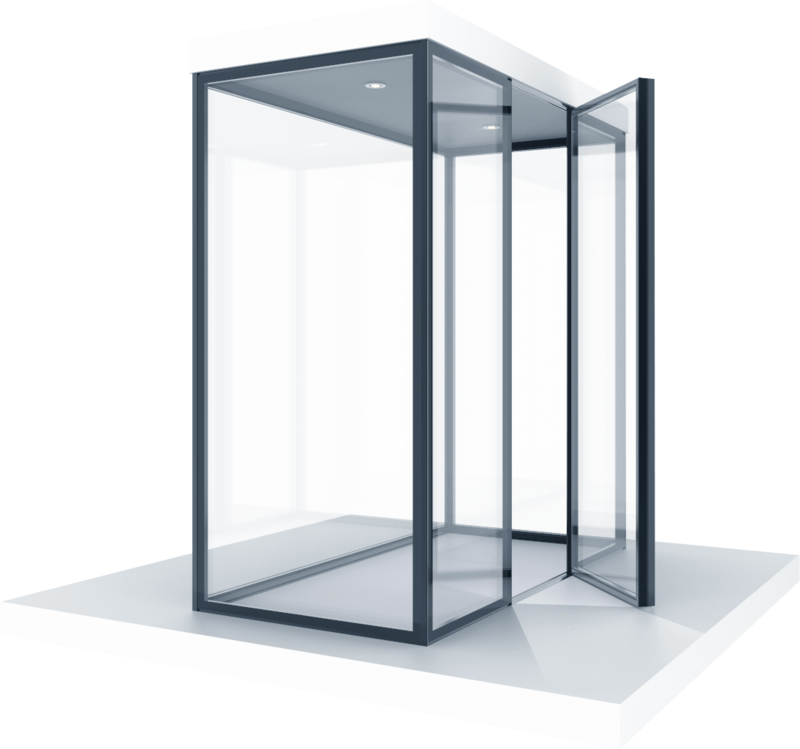 Its thermal resistance is higher than with standard glass. Offers a maximized glass surface. CAVEA is the world’s first glass cellar designed for aging wines. The glass composition is a result of long-term research. Its construction differs from the rest, with multiple filters that are overlapped in a precise order. This combination ensures that the glass will protect the wine from the damaging effects of light. Actually, light initiates many chemical reactions. The light’s shortest wavelengths – UV rays – are mostly responsible for light strike, a condition that produces an unpleasant aroma of boiled cabbage and cooked onions. Natural light and even fluorescent light found in markets and wine shops can spoil the wine’s aroma in less than a week. The light’s longest wavelengths – infrared rays – will heat the wine inside the bottle, causing irreversible damage. CAVEA protects the wine against all types of rays. 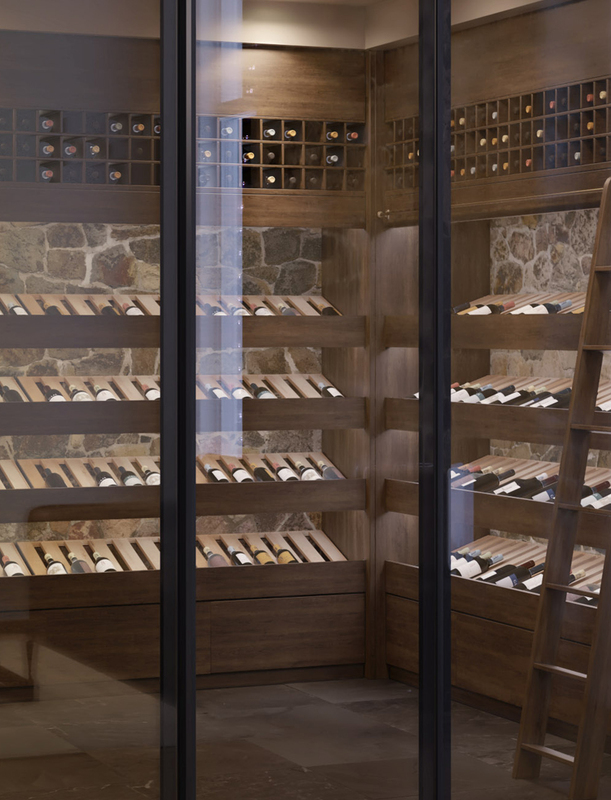 Recreates the same efficient performances found in natural cellars all within a glass enclosed wine cellar. CAVEA’s airtight construction protects the wine against temperature variations, dryness of air and odours. Far from being a mere glass panelled enclosure, CAVEA is actually a glass partitioning system equipped with a very complex mechanism. Its purpose: achieve absolute airtightness no matter its configuration. The combination of integrated elements such as flexible seals, continuous hinges as well as a dual latch closing system create a genuine seal against harmful elements that could alter the wine’s structural integrity. At the heart of CAVEA’s system is a 51 mm thick thermo-glass with a R6 heat insulation coefficient. Due to its unique combination, the glass’s thermal resistance is seven times greater than with a single 12 mm laminated glass commonly used in building a glass cellar. One system with endless configurations. 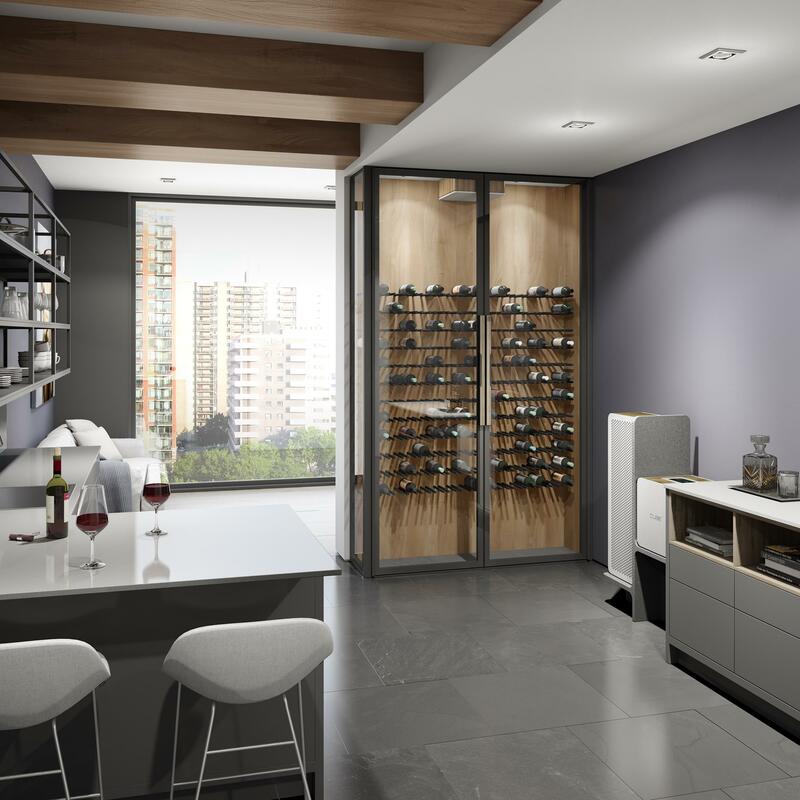 No matter if the cellar’s configuration includes a fixed panel, a single door, a double door or a combination of all of these elements, with CAVEA, nothing is impossible. Engineers working at The Wine Square have carefully designed more than 21 aluminum profiles that fit together perfectly, offering endless configurations that can be adjusted to fit the room’s imperfections. Offering ideal wine maturing conditions, CAVEA’s high-performance glass system differs from the rest with its complete hidden structure. In line with current trends, this combination maximizes the glass’s surface without compromising the wine’s quality. CAVEA’s integrated framing makes it possible to benefit from having insulated glass without having the inconvenience of a massive and bulky structure.